Round Two of the Under 19 Male National Championships in Adelaide was full of drama, with a number of clashes going down to the wire. The Cricket Australia XI claimed a thrilling one-run victory against Victoria Metro in a see-sawing affair at Parkinson Oval. Jayden Goodwin anchored the CA XI innings early with watchful 44, to get his side off to a modest start. However, it was all-rounder Will Sanders who stole the show with a quick-fire 66 off 58, propelling the CA XI to a total of 253. With the game evenly poised, Victoria Metro got off to a slow start, before a middle-order collapse saw them fall to 6-117. Skipper Will Sutherland produced an innings to remember, becoming the backbone of the innings with 86 off 81. Partnered by fast bowler Sam Elliott who hit 71, the pair put on 97 for the seventh wicket to bring their side within touching distance of an unlikely victory. Requiring two runs off the final over with one wicket in hand, Bailey Moon dismissed Victorian tailender Zak Evans to give the CA XI a big victory. Tasmanian captain Keegan Oates continued his strong run of form, backing up his 99 not out in round one with a dominant 124 to steer his side to a comfortable five wicket victory at Woodville Oval. Sporting eight different wicket takers, it was a total team effort from Tasmania in the field, keeping Western Australia to a total of 241. This was boosted by the late innings striking of middle order batsman Connor Smith, whose 88 off 91 deliveries kept his team in the hunt. However, the West Australians were unable to stop Oates, who with the assistance of Jake Williams’ patient 49 was able to achieve the target with eight balls to spare. Over at Glandore Oval, NSW Metro continued their strong start to the championships with a comprehensive 189-run win against Queensland. Wicket-keeper Baxter Holt was the star of the show, smashing 111 off 119 balls to get his side off to a quick start. Holt was supported well by Sam Fanning who backed up his 99 against Northern Territory with 77 in a 151-run opening stand. Following his incredible double hundred in round one, captain Ollie Davies was again amongst the runs with 41 off 33, while Lachlan Hearne provided a steady hand to close the innings with 31 to see NSW Metro to a handsome total of 321. Josh Kann was the pick of the bowlers for Queensland, with the right arm quick claiming 4-67 off his ten overs. In reply, Queensland never got going as regular loss of wickets saw them bowled out for 132 off 27 overs. Kann was again the standout with a team high 42 for Queensland, while Liam Scott (3-20), Trent Weir (3-21) and Joel Foster (2-27) took care of business with the ball for NSW Metro. It was a nail-biter on Karen Rolton Oval, with ACT/NSW Country downing South Australia by three wickets. Batting first, the South Australian top order could not replicate their heroics of round one as the hosts slumped to 7-63. Wicket-keeper Daniel Kerber saved the innings, with his 76 off 82 and some late hitting by leg-spinning sensation Lloyd Pope helping bring the total up to 200. 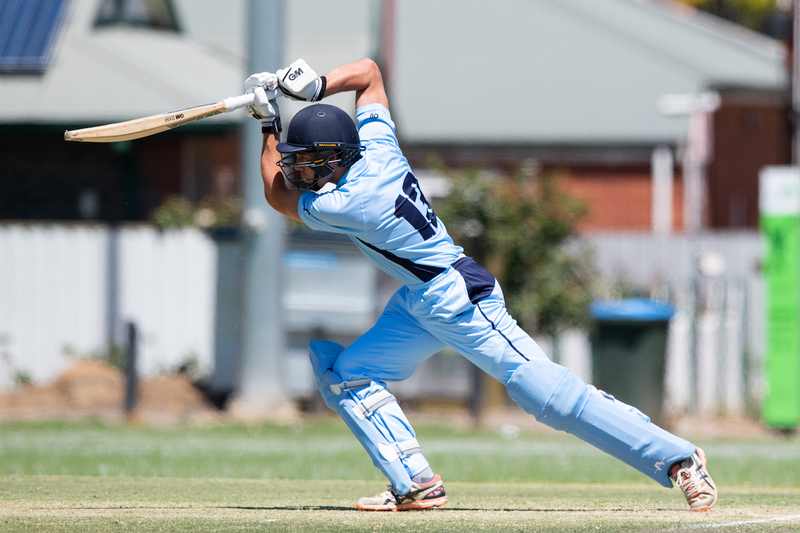 In a run chase filled with drama, ACT/NSW Country were just able to scrape over the line thanks to a brilliant 69 not out by all-rounder Henry Railz. After slipping to 5-87, Railz' composure came up trumps against the South Australian attack. Josh Pengelley was the star for South Australia, with the big quick claiming excellent figures of 3-32. At Park 25, Victoria Country claimed their first win of the championships with a four-wicket win over Northern Territory. James Ryan was the standout performer for Victoria Country with a blistering 69 off 54 balls which included four sixes, while Yash Pednekar was crucial in the run chase, stroking a classy 47 not out to guide his team home. William Crook was the standout for Northern Territory, with the big quick claiming figures of 2-16 off six overs. With the teams enjoying a rest day tomorrow, play will continue on Thursday from 10am local time.